The Suez Canal is a 104 Nm long artificial channel, 24 m (79ft) deep and 205 meters (673 ft) wide, connecting the Mediterranean Sea and the Red Sea. with only two points wide enough to allow passing. transit from North to South our from South to North ? Click on a location to get a summary of what the map shows. You can then view a digital version of the original map by clicking Open Image. A fascinating collection of historical maps showcasing how some of biggest cities have changed since the 17th century, and how far map-making techniques have come, is now online. Maps of London in the 19th Century, trade routes through Africa from 1842, nautical charts of Cuba and how the globe looked in 1790 are just some of the incredibly detailed pieces in the collection. Each individual map has been overlayed onto a current world map, so you can compare how much the area has developed. 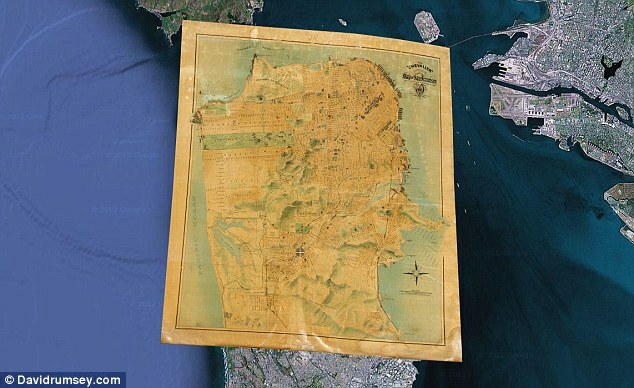 This detailed map of San Francisco shows important buildings and public improvements as illustrations. The map was made to celebrate the rebuilding of the city after the earthquake and fire of 1906. Cultural features on the maps can be compared to what they look like now by using the slider bars to adjust transparency. 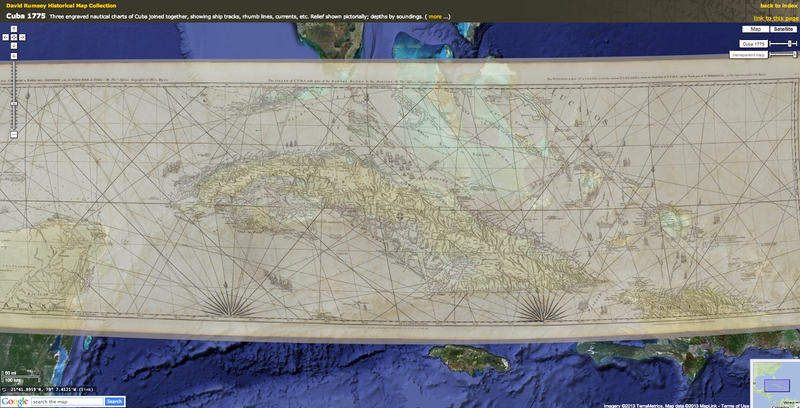 All the maps range from 1680 to 1930 and show scales and cartographic art. Each one is georeferenced so that the old maps appear on exactly the correct spot on the current global map - rather than the general area. The maps are taken from historical maps from the Google Maps collection stored in the GeoGarage platform, as well as the Google Earth Rumsey Historical Maps sites. Rumsey has a collection of more than 170,000 maps, which he has been collecting for 30 years. 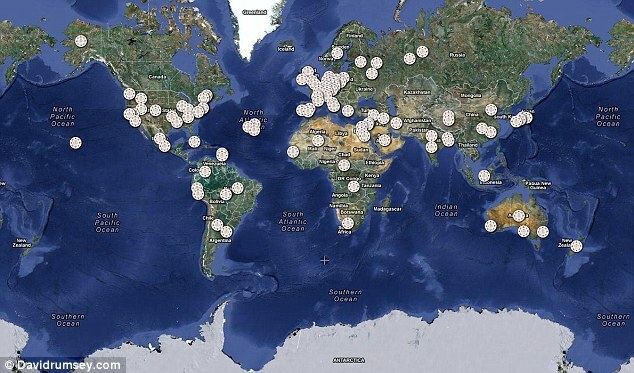 He began putting them online, in high resolution, in 1999 and ll the maps can be downloaded for personal use. Rumsey turns the original historical maps into digital images by scanning them using a high-resolution camera. The digital images are then georeferenced using a GIS program. GIS programs takes points on the old maps such as cities, coast lines, rivers and streets and connects them to the same points on a modern satellite map. Up to 200 accuracy points can be taken for larger maps. The GIS program then uses these points to recreate the digital image so it will fit into its modern geographical space. Because many locations have changed in size and shape the images sometimes have to be curved to achieve this. 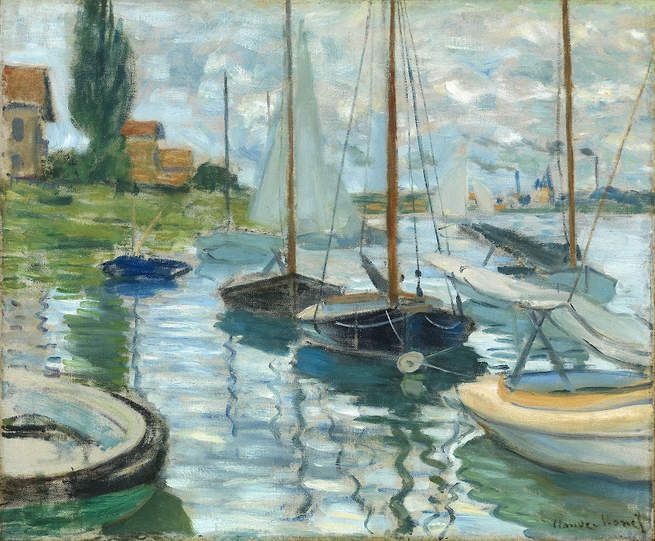 Did you know that 85% of Impressionists had sailor, yachtsman or boat designer on their résumé? This nautical background, not often explored, inspired the many water scenes celebrated in a new book and related exhibition. The new publication IMPRESSIONISTS ON THE WATER, coinciding with a major exhibition at the Legion of Honor organized by the Fine Arts Museums of San Francisco, traces the history of light-infused water scenes within the social context of the latter nineteenth century. 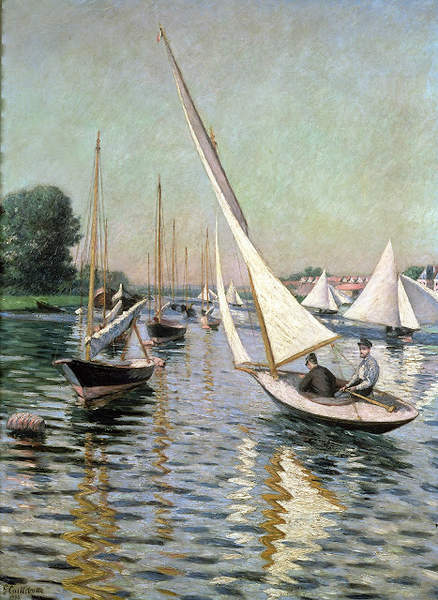 Water, boats, and all things nautical provided natural fodder for Impressionists, many of whom were sailors and yachtsman themselves—Pissarro had sailed the Atlantic several times, Bazille was as much a champion rower as a painter, though Manet, unfortunately failed twice in his goal to become a naval officer. This catalogue reveals intriguing details behind key paintings from this period and includes a chronology of Gustave Caillebotte’s boating life, who was one of the movement’s forerunners and most proactive yachtsman. Through essays by noted art historians, the book illuminates historical and cultural aspects of the nautical themes embraced by the Impressionists, including their connections to contemporary life such as the literature of Zola and Maupassant, leisure, and technology. IMPRESSIONISTS ON THE WATER is a collection of works focused on rowing, yachting, and sailing, on rivers and on sea, while highlighting the boatyards, clubs, and many regattas frequented by the artists. A brilliant synthesis of boating and aesthetics, this book will be cherished by coastal admirers, scholars, and connoisseurs of one of the most beloved periods in art history. One of the contributors, Phillip Dennis Cate, former director of the Jane Voorhees Zimmerli Art Museum in New Jersey, is a specialist in nineteenth-century French art. Daniel Charles is a noted historian of innovation and technology, with a particular expertise in maritime history. Christopher Lloyd, a specialist in the art of the Italian Renaissance, French Impressionism, and British painting, was a curator in the Department of Western Art at the Ashmolean Museum at Oxford University for twenty years before becoming Surveyor of the Queen’s Pictures from 1988–2005. 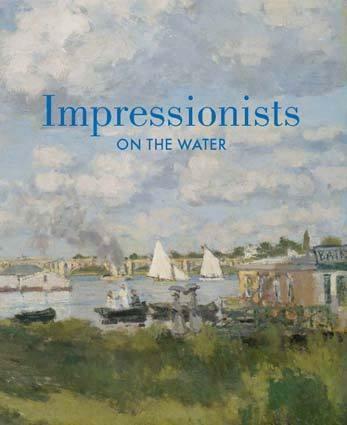 Impressionists on the Water, by Phillip Dennis Cate, Daniel Charles and Christopher Lloyd, will be released by Skira Rizzoli, in June 2013. The exhibition opens at the Fine Arts Museums of San Francisco, Legion of Honor, San Francisco, California, from June 1-October 6, 2013, and travels to the Peabody Essex Museum, Salem, Massachusetts, from November 9, 2013-February 9, 2014. 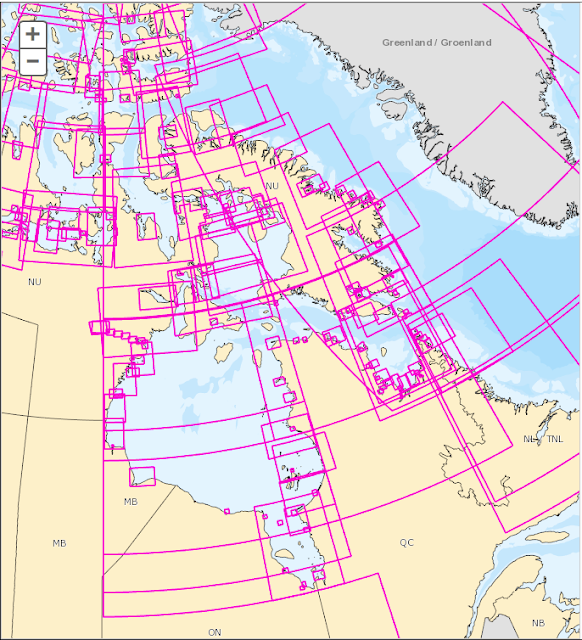 The Arctic Voyage Planning Guide (AVPG), published by Fisheries & Oceans Canada, is a strategic planning tool for vessels navigating the Canadian Arctic. The government publishers begin by explaining that the guide, a compilation of data and services relevant to mariners, is not intended to replace official carriage information or products provided from Canadian sources. In case of disparity, the information contained in official publications will prevail. The mariners remain responsible for navigational decisions and safety of their ships. The information provided in this guide should be used together with all other relevant information, as required by law, standards and good seamanship practices. The Arctic Voyage Planning Guide (AVPG) is intended as a strategic planning tool for national and international vessels traveling in the Canadian Arctic. It draws together regulatory information pursuant to the Canada Shipping Act, 2001 and the Charts and Nautical Publications Regulations, 1995 as well as complementary data and information from Canadian federal departments with mandates to support safe navigation. The intent of the AVPG is to provide a comprehensive digital planning tool for mariners considering an Arctic voyage. The AVPG is not intended to replace official carriage information or products provided from Canadian sources. DMA : ArcticWeb e-Navigation, single point of access to safety related information, provides streamlined reporting and allows for voluntary coordinated voyage through sharing of positions and planned routes. Most seafaring vessels use an onboard device called an automatic identification system (AIS) receiver that store a wealth of information about the ship. And according to research from the security experts at Boston's Rapid7 Labs, AIS receivers are ridiculously insecure. Rapid7 studied over 34,000 vessels around the world and, because of their AIS devices, were able to identify and track individual ships, GPS coordinates and outgoing communications from every vessel involved. To suggest that most seafaring ships — including tankers, fishing boats and military vessels — could be hacked would be an insult to industrious hackers everywhere. Instead, reading a ship's private or sensitive communications requires no hacking knowledge whatsoever. The amount of publicly broadcast, potentially sensitive material on the ocean is staggering. The Nationwide Automatic Identification System (NAIS) consists of approximately 200 VHF receiver sites located throughout the coastal continental US, inland rivers, Alaska, Hawaii and Guam. NAIS is designed to collect AIS transmissions from local vessels. Currently, NAIS collects valuable maritime data in 58 critical ports throughout the United States for use by Coast Guard operators and port partners. The primary goal of NAIS is to increase Maritime Domain Awareness (MDA) through data dissemination via a network infrastructure, particularly focusing on improving maritime security, marine and navigational safety, search and rescue, and environmental protection services. All you need to monitor AIS transmissions is an AIS receiver of your own. Whenever a ship broadcasts its position on AIS (which it does every one to three minutes, by default), it includes a Maritime Mobile Service Identity (MMSI) number. Every ship has a unique MMSI number, which means that an interested party could identify any ship that broadcasts its position over AIS. Put the MMSI and the latitude/longitude coordinates together, and you can not only pick out a vessel, but track its course as well. This information is particularly troubling for military and law-enforcement ships, whose AIS receivers broadcast location and MMSI information in exactly the same way as private ones. Rapid7 was able to identify and track 29 law-enforcement vessels and 27 military ships. It's not hard to imagine what a group of pirates or terrorists might do with the same facts — and if Rapid7 can find compromising information, so can malefactors. AIS receivers can also broadcast short, all-caps messages, ranging from the pleasant ("GOOD AFTERNOON HAVE A NICE DAY") to the informative ("VISIBILITY OF LESS THAN 1 NAUTICAL MILES IS REPORTED") to the potentially compromising ("CRANE VESSEL HERMOD TOWED BY TUG HUS"). Monitoring safety messages is time-consuming but not difficult, and could yield some juicy information for those with malicious intent. Rapid7 has categorized AIS transmissions as a security threat, and it's not alone in doing so. In 2004, the International Maritime Organization called the unsecured transmission and free sharing of AIS data "detrimental to the safety and security of ships and port facilities." "In relation to the issue of freely available automatic identification system (AIS)-generated ship data on the world-wide web, the MSC agreed that the publication on the world-wide web or elsewhere of AIS data transmitted by ships could be detrimental to the safety and security of ships and port facilities and was undermining the efforts of the Organization and its Member States to enhance the safety of navigation and security in the international maritime transport sector. The Committee condemned the regrettable publication on the world-wide web, or elsewhere, of AIS data transmitted by ships and urged Member Governments, subject to the provisions of their national laws, to discourage those who make available AIS data to others for publication on the world-wide web, or elsewhere from doing so. In addition, the Committee condemned those who irresponsibly publish AIS data transmitted by ships on the world-wide web, or elsewhere, particularly if they offer services to the shipping and port industries." Furthermore, many AIS devices have Internet capabilities, meaning that all of the information they receive and collect can be uploaded as soon as the ship pulls into a Wi-Fi-enabled port. There is no evidence that hackers could compromise or hijack an AIS device, but then again, there is no evidence that anyone has ever tried. Considering that oceangoing vessels are responsible for an enormous chunk of global commerce and defense, leaving a primary means of communication undefended seems like asking for trouble. Internet pirates are troublesome enough without bringing real ones into the mix. of 32.2 knots maximum speed with an average of the best 10 seconds of 29.1 knots. Almost all of the Moths are equipped with a Velocitek instrument that in addition to providing real-time information such as speed, heading, distance from the starting line and shifts, keeps track of all the navigation and keeps track of the maximum and the average of the best 10 seconds allowing you to see the two measures on the display. What if they treated gene patents like nautical charts? About the idea of treating genetic sequences like maps : using copyright law not patent law. on maps used for 250 years? Patents on human genes are controversial, and the U.S. Supreme Court may well make them illegal in a decision expected later this year. But a Cornell Law School scholar suggests the court should take another approach, one that has been around for at least 250 years over another type of intellectual property that is strikingly similar to a gene sequence: Charts and maps. A human gene is nothing more than a sequence of A’s, T’s, C’s and G’s representing the chemicals that make up the strands of a DNA molecule. Each gene has a beginning and an end, and determining where those are takes a lot of skill and experimentation. But a gene is not an invention in any conventional sense, because it wasn’t created by the hands of humans. In fact, if it isn’t an exact replica of what is found in nature, it is useless. The same goes for maps. They require skill and work to create but done right, they’re an exact representation of the physical earth — if not, people can die. Yet even though a good map is nothing more than a copy of nature, they’ve been specifically covered by copyright law, a close cousin of patent law, at least since the 1700s. Maps and charts are protected against exact copies, but anyone is free to make their own if they want to put the work into it. “What’s neat about maps is you can get a copyright on a map, but you don’t get a lot of exclusive rights in it,” said Oskar Liivak of Cornell Law School, a physicist who worked on quantum computing at IBM before studying intellectual property at Yale Law School. Liivak thinks the Supreme Court, or possibly Congress, should consider a similar approach toward gene patents. That would be better, he says, than the all-or-nothing solution that may come down when the court decides Association for Molecular Pathology vs. Myriad Genetics later this year. That case, argued last week, involves patents on human genes that are associated with breast cancer. Myriad says it needs patent protection for the years of research it invested in finding the genes. Opponents say Myriad’s patents should be found invalid because they prevent researchers from studying those same genes. Copyrights aren’t patents, of course, but they’re awfully close. Both stem from the same clause in Article I, Section 8 of the Constitution, and the Supreme Court has referred to patent law in copyright cases and vice versa repeatedly over the years, Liivak told me. The problem with gene patents is they cover, by definition, something that no human created by design. Myriad argues the BRCA genes it patented don’t occur in nature because they are tiny snippets of an immense DNA molecule that took years of research to define. But researchers say the proper analogy is to an apple: It’s useful if you separate it from the tree, but that doesn’t make it an invention. If Myriad can patent a gene, the argument goes, they preclude everybody else from using that gene and offer no opportunity, as with an invention, to “design around” it with another invention that does the same thing. Maps and charts present a similar quandary. Governments in England and the U.S. sought to protect mapmakers to encourage them to produce more of the navigational charts that enhanced maritime traffic and trade. Yet competing mapmakers couldn’t be prohibited from making a chart of the English Channel simply because an earlier version existed. No one could hold a copyright on the navigational coordinates for the approach to Sheerness. But allowing alternate maps raises other tough questions such as: Could a mapmaker use an existing map to safely navigate the Channel while making his own calculations for a new one? Could he use it to check his work? These are all far from the absolute ban on copying that patents provide, and would solve the problem facing researchers who must isolate a patented gene sequence in order to study it. (The Supreme Court muddied the waters a bit with Feist vs. Rural Telephone Services in 1992, which struck down the copyright on a telephone book for lack of originality. Nobody involved in Myriad is suggesting Liivak’s solution, and he acknowledged it’s unlikely anybody will. Defenders of gene patents have billions of dollars invested in their position, and opponents tend to be ideologically opposed to the idea of commercializing genes, full stop. But Congress has stepped in and passed laws covering a similar area in the past. The Plant Patent Act of 1930 was designed to encourage the cultivation of new varieties of plants by prohibiting competitors from cultivating the offspring of those plants without permission. It doesn’t prevent somebody from making an exact copy on their own, but merely prohibits them from grafts or seeds from the original version. It may seem unworkable to have a system that allows competitors to use exact copies of a patented gene simply if they say they arrived at it through their own research, but the law has actually dealt with this problem for centuries. The rules could be fairly simple, Liivak said: If researchers can demonstrate they derived the genes on their own, and only used the patented genes afterward to check their work, they get a pass. Luckily for the lawyers, research “leaves a rich paper trail,” he said. A strong ruling from the Supreme Court striking down all gene patents could cause more harm than good, he concluded. The Marine GeoGarage has launched a business-to-business online mapping service with worldwide nautical charts with a new API (Application Programming Interface), which is already in use by a number of public and private-sector organizations. It offers single-source access to premium map data at a variety of scales from the GeoGarage Cloud Computing solution through its tile mapping service (TMS). The GeoGarage hosts all map data, which saves significant time and costs as organizations avoid the need to store and manage the data in-house. Built on industry standards, the GeoGarage works across all browsers and operating systems. It may be used in conjunction with or to supplement existing web-based map viewing applications built around Google Maps, Microsoft Bing or OpenLayers applications for example. "The creation of the B2B service responds to the growing demand of our customers who wish to develop an integrated webmapping solution benefiting from official and regularly updated nautical charts. The GeoGarage provides a custom API for customers interested in accessing our marine map layers and integrating them into their own products. 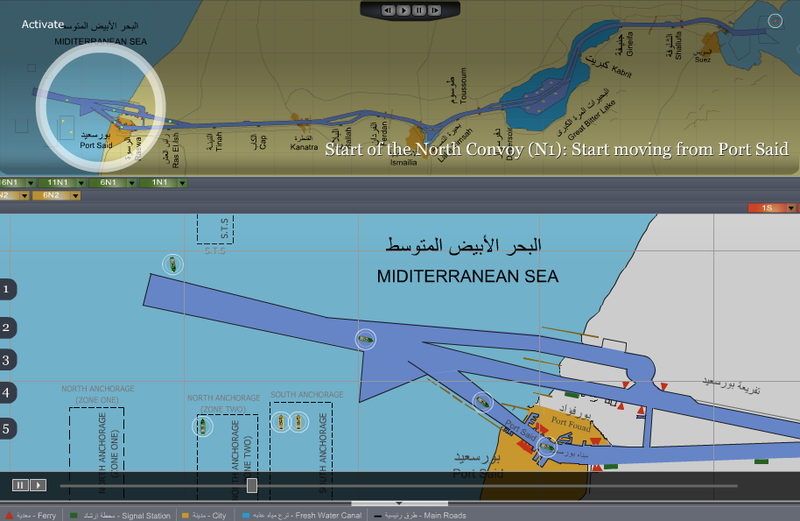 We make it easy for customers to quickly and easily integrate our nautical layers onto a new or existing Google Map. With just a few lines of code you get all the GeoGarage functionality without all the setup hassle. We provide a convenient and reliable service that has helped our partners enhance the value of their sites.". With the GeoGarage, nautical mapping enters in the area of dematerialization : the platform has the vocation to be the largest broadcaster for nautical maps. Through data licenses from official worldwide Hydrographic Services, GeoGarage combines all the georeferenced charts from USA, Canada, Brazil, Argentina, UK, Netherlands, Belgium, Germany, France, Spain, Portugal, Croatia, Island, South Africa, Australia, New Zealand, Bahamas. Other countries are being studied. with the North Pole at its centre. The map features a number of static and dynamic layers that visualise the beauty of the Arctic, the threats it faces and our struggle to protect it. The Arctic is under pressure from oil companies seeking to exploit its resources. They see the melting of the sea ice not as a warning, but as a business opportunity. Join the North Pole Expedition and follow the team as they make their way to the pole, with frequent, near-live, updates of their position and a geoblog of all the tweets, blogs, pictures and videos. The Lighthouse Atoll in the Belize Barrier Reef is featured in this image acquired by Japan’s ALOS satellite. In the upper-central part of the image, an underwater sinkhole known as the Great Blue Hole appears as a dark blue circle. Surrounded by the shallow waters of the coral reef, the Great Blue Hole measures over 300 m in diameter and about 123 m deep. Formed when the sea level was much lower, rain and chemical weathering eroded the exposed terrain. Water later filled the hole and covered the area when the sea level rose at the end of the ice age. Also visible in the image are two coral islands – green with vegetation – called cayes. The larger to the west is Long Caye, and the smaller Half Moon Caye is to the east. As part of the Belize National Parks, the Half Moon Caye Natural Monument was the country’s first protected area. The almost 40 sq km island is an important breeding area for the seabird, the Red-footed Booby. The greater Belize Barrier Reef has been a UNESCO World Heritage Site since 1996, but in 2009 it was put on the List of World Heritage in Danger. The reef provides a significant habitat for threatened species, including marine turtles, manatees and the American marine crocodile. The Advanced Land Observing Satellite captured this image on 29 March 2011 with its Advanced Visible and Near Infrared Radiometer, which is designed to chart land cover and vegetation in visible and near-infrared spectral bands, at a ground resolution of 10 m.